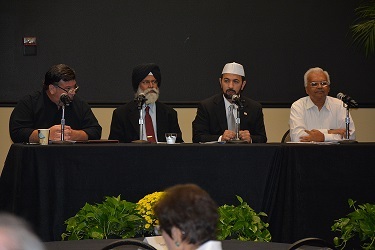 On October 16, the Prince Mohammad Bin Fahd Program for Strategic Research and Studies at the University of Central Florida hosted its 2014 Interfaith Forum at the Pegasus Ballroom in the Student Union Building. Local participation included an interfaith panel–(from left in photo) Rev. Bryan Fulwider, Christian, and president of the nonprofit Building US; Mr. Navtej Khalsa, Sikh, and regional director of the Sikh American Legal Defense and Education Fund; Imam Muhammad Musri, Muslim, and president of the Islamic Society of Central Florida; and Mr. Abhinav Dwivedi, Hindu, and CEO of the Hindu University of America. The panel was moderated by Amirah Masnavi, director of The Grand Voices Project. Featured speaker was the U.N. High Representative for the Alliance of Civilizations, H.E. Nassir Abdulaziz Al-Nasser. Also speaking was M. Arsalan Suleman, the U.S. Department of State’s Counselor for Multilateral Affairs and Deputy Envoy to the Organisation of Islamic Cooperation. The Adoption and Foster Care Ministry at Northland Church will feature “Orphan Sunday” during all five services on November 1 to 3 (Saturday at 5 pm; Sunday at 9 am, 11 am, 5 pm; Monday at 7 pm) to raise awareness of the many children in need of families, to provide support for families who have adopted or are fostering children, and to build a community that supports one another. Those who are considering adoption or foster parenting will not want to miss this special weekend. Local organizations that provide adoption and foster care services will be on hand—Community-Based Care (CBC), the Department of Children and Families (DCF), 4Kids and several adoption agencies. An organization called Devereux will also share important information about their Delta program—foster care for young people who have been rescued from human trafficking. Delta families receive intensive training and support for these very special children. In addition, Northland’s Adoption and Foster Care Ministry meets the third Thursday of each month at its Longwood campus (530 Dog Track Road, Longwood, FL 32750). This ministry exists to help families who are fostering or who have adopted, as well as those considering adopting or becoming foster parents. Experienced families share their joys and struggles, and encourage other families that may be new to this journey. For further information email Northland or phone 407-949-7147. As part of Central Florida’s Educate–Celebrate–Commemorate–Act! initiative, the Jewish Community Relations Council of the Jewish Federation of Greater Orlando is inviting the public to “A 50-Year Retrospective on Civil Rights,” which will look back at the Civil Rights Movement and forward to the challenges that remain. Brad Herzog, co-author of the book My Mantelpiece: A Memoir of Survival and Social Justice, will speak about the Freedom Summer (1964) and the story of civil-rights volunteer Andy Goodman, who disappeared in Mississippi that year. Participants on the panel responding to Herzog’s presentation–which will be moderated by Professor Terri Fine–include Rabbi Steven Engel, Professor Scot French, Judge Emerson Thompson and Commissioner Sam Ings. 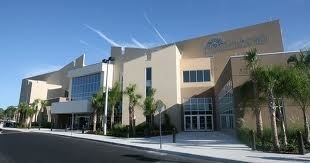 The event, to be held in the Jewish Community Center Auditorium, will begin at 1:00 pm. It’s free and open to the entire community. An “early-afternoon brunch” of bagels and grits will be served. Please RSVP to www.JFGO.org. For more information, email Lisa Sholk, or phone her at 407-645-5933. The New Age Group (seniors group) of the Hindu Society of Central Florida will conduct its third annual Multi-Faith Workshop in the facility’s community room (1994 Lake Drive, Casselberry, FL 32707) on Sunday, November 2, at 1:30 pm. The Multi-Faith Workshop is presented in collaboration with Hindu University of America, the Chinmaya Mission, the Sikh Society of Central Florida and the Interfaith Council of Central Florida. The event is free, with prior RSVP. The public is invited. The program will have a double focus: prayers for global peace, and speakers from a variety of faith traditions will each give a brief presentation on what their respective faith tradition does to improve the life and opportunity for women. Refreshments and a time for social interaction will conclude the event. Are you panicked because your child who was born only a couple of years ago (at least that’s how long it seems!) is going to graduate from high school next spring and head off to college in the fall, and you’re filled with questions and consternation and aren’t quite sure where to turn, and among your many concerns is the support for your faith tradition that might be available where your “pride and joy” may end up studying? Be consternated no longer–if you’re Jewish, that is–because a tool to help has been developed. “For many incoming Jewish freshmen, the presence of a Jewish student body on-campus is as crucial as the general academic and social merits of the institution itself,” says Kimberly Johnson, who played a major role in the Jewish-focused project. “To compile our list of the best colleges that have active Jewish communities, we first looked at academic excellence and student satisfaction, and then factored in the presence of Jewish social groups, student populations, and support systems.” You can peruse the Jewish-specific information at BestColleges.com. The CATCH (Coordinated Approach To Child Health) program at Rollins College needs volunteers age 50+ to work with children to instill healthy eating and fitness habits. Teams of 5-8 adults lead children in a one-hour weekly session consisting of a nutritious snack, health lesson and physical activity. Free training provided. CATCH is part of Rollins College’s Volunteers Organized in Community Engagement (VOICE) program. Click here for more detail, or phone 407-646-2459. Need a break? Hoping to recalibrate your too-busy life? Think viewing an array of beautiful autumn flowers and other foliage might help? Then you need to squeeze in a stroll through Leu Gardens on Monday, November 3, sometime between 9:00 am and 5:00 pm. The great news is that on November 3 you won’t even have to pay to get in. Admission is free. Of course, the Leu Garden staff hope you’ll fall in love with the experience and become a regular visitor. Even a member. And the truth is, you just might. 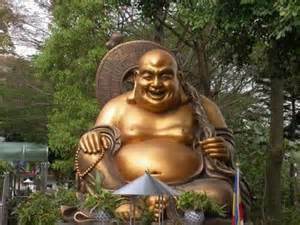 So why not put the proverbial toe in the water and check it out? The Islamic Center of Orlando is sponsoring an open house at 6:30 pm every Wednesday night to answer the public’s questions about the Islamic faith. And it’s being done in a relaxed and casual setting “over a cup of coffee.” They’re even providing the coffee! The question-and-answer events will be held in the dining room of the Muslim Academy of Orlando (MAGO), situated at 11551 Ruby Lake Road, Orlando, FL 32836 (just off Apopka-Vineland Road, near Lake Buena Vista). For more detail or to make a reservation, phone 407-495-6139. On Thursday, November 6, at 6:00 pm, Angela King, a former skinhead who turned her life around in prison and is now actively involved in tolerance education, will speak at a Teacher Forum at the Holocaust Center (851 North Maitland Avenue, Maitland, FL 32751). To understand racism, King asserts, we must understand hatred and redemption. And there are few people in this world better able to talk about this difficult subject than she is. In prison she came to terms with her past mistakes and is now an educational consultant who talks frankly about what took her down a wrong path and what opened her heart and life to embracing those she used to mock and despise. Come hear her story about “Life After Hate” and the insights that can protect other young people from making the same shameful choices that nearly ruined her life. The event is free and open to the public. RSVP by email or phone Mitch Bloomer at 407-628-0555 ext 283. Educators may earn inservice credit for attending. On November 6, Sikhs around the world will celebrate the 545th birthday anniversary of Guru Nanak Dev Ji, commemorating the birth and philosophy of the first Sikh Guru and founder of Sikhism. The Orlando-Oviedo gurdwara (temple) is situated between Dean and Chapman roads at 2527 West State Road 426, Oviedo, FL 32765. At that facility, the Sikhs will be celebrating Guru Nanak’s birthday with the following worship services (Kirtans): Thursday, November 6, special worship service commemorating Guru Nanak on his actual birthday, from 7:15 to 8.30 pm, followed by a communal meal (Langar). Friday, November 7, worship from 7:15 to 8:30 pm, followed by a communal meal. Saturday, November 8, worship from 7:15 to 8:30 pm, followed by a communal meal. Sunday, November 9, worship from 11:30 am to 1:00 pm followed by a communal meal. The public is invited to attend any or all of the services. The Holocaust Center (851 North Maitland Avenue, Maitland, FL 32751) invites the Jewish community and the public at large to come together at 4:00 pm on November 9 to reflect on a dark period in human history when, on November 9-10, 1938, the Nazi regime in Germany and Austria orchestrated the destruction and/or ransacking of thousands of Jewish homes, shops, schools and synagogues, leaving the streets covered in pieces of smashed windows—thus the origin of the name Kristallnacht, “Night of Broken Glass.” That terrifying night marks the moment that should have erased any doubt about Hitler’s intentions. 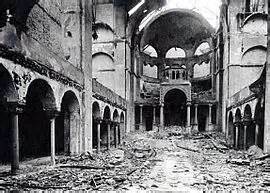 Jewish lives were in jeopardy, and clearly there would be further tragedy. Yet the world stood by in silence. To commemorate this tragic time, the Holocaust Center is hosting a concert of extraordinary music–“The Music of Courage”–that reflects the past, present and future of people of courage. It will feature the talents of pianist Dr. Rose Grace, a faculty member at Bethune-Cookman University, and oboist Dr. Aaron Hilbun, of the Department of Music at Rollins College. Together, they will present a unique musical program that commemorates the tragedies of the Holocaust and the hope of new generations. This program, being held next door to the Holocaust Center in the Auditorium of the Jewish Community Center, is open to the public and free of charge. Reservations are not required. For information call 407-628-0555. The Holocaust Center (851 North Maitland Avenue, Maitland, FL 32751) will host a panel discussion about marginalized communities on Wednesday, November 12, at 7:00 pm, addressing such questions as: How do we decide who “doesn’t belong”? Why do we do it? What do we need to change? Panel members will be Sister Anne Kendrick (Hope CommUnity Center), Michael Slaymaker (Easter Seals) and Bryan Fulwider (BuildingUS). Darryl Owens (Orlando Sentinel) will moderate. This is an opportunity to talk about how we can make our community safer and more welcoming for everyone. A downloadable poster for the event is available on the Central Florida Civil Rights website. Reservations are appreciated but not required. The topic for the monthly Interfaith Discussion to be held on Wednesday, November 12, is: “How and to what degree do you think religion played a role in determining the outcome of each of the three constitutional amendments on the November 4 ballot in Florida?” The discussion group meets from 7:00 to 8:30 pm on the second Wednesday of each month at Adventist University of Health Sciences (671 Winyah Drive, Orlando, FL 32803) on Florida Hospital’s main campus. The discussions are respectful, open and candid, and the participants represent a variety of faith traditions as well as those who question the validity of faith altogether. For directions to the meeting place, click here. Admission is free. Everyone is invited. Would your family like to get more involved in the community? If so, Community Food and Outreach has just the opportunity for you. On the second Friday of each month–the next two will be November 14 and December 12–CFOC hosts “Family Volunteer Night” from 5:00 to 8:00 p.m. These monthly events are meant to bring families together in the spirit of service. There will be pizza, music and a whole lot of fun as volunteers engage in an array of activities. All ages are encouraged to participate. Specific tasks include: cleaning and restocking shelves; reorganizing the warehouse area; painting; washing windows; replacing air filters and cleaning vent covers; and steam cleaning carpets in the offices. If you’re interested in this opportunity, please contact Mark Perez. CFOC also offers a variety of other volunteer opportunities for individuals and groups, both on site and off. As part of a program promoting healthier eating among low-income seniors, the Christian nonprofit Our Whole Community will conduct training sessions for residents of the Plymouth Apartments on Gay Road in Winter Park on November 17 this year and on February 3, February 17 and April 2 next year. The sessions will be conducted on site at the apartments. OWC is partnering on this initiative with the Winter Park Housing Authority. OWC is supplying the growboxes and growbox instruction. For more information, email Leah Nash or phone call 407-758-5324. The Peace and Justice Initiative at Valencia College is hosting a lecture by Dr. Peggy McIntosh, followed by a discussion, on Thursday, November 20, at the Winter Park Community Center (1721 West New England Avenue, Winter Park, FL 32789). Dr. McIntosh is probably best known for authoring White Privilege: Unpacking the Invisible Knapsack (1988), an article that launched a national discussion now central to dialogues on race. 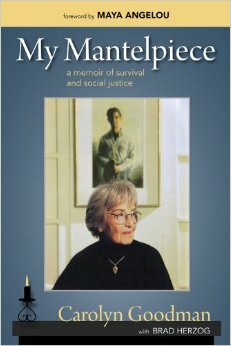 Speaking about her recent National Center for Race Amity Award (presented by the Baha’i faith), McIntosh reflects, “I think that ‘amity,’ a word of peace, is an appropriate word for the effect that my work has had on race relations in the U.S., for my analysis is not about shame, blame or guilt. We did not invent the social systems we were born into. My question is, How can we use systems of unearned advantage to weaken systems of unearned advantage?” The event will begin at 4:30 pm with an hour of refreshments and socializing, followed by the presentation and discussion from 5:30 to 7:00 pm. 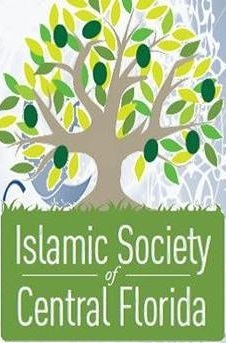 On the fourth Saturday of every month, the Islamic Society of Central Florida hosts an “Open House Invitational” at which you can learn about Islam and the Muslim community from Muslims themselves. The event Includes a presentation, a question-and-answer time, an international dinner, a tour of the mosque, and more. 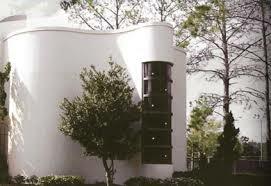 The event is conducted at the Center for Peace at the headquarters of the Islamic Society of Central Florida (1021 North Goldenrod Road, Orlando, Florida 32807). A tour of the mosque will be conducted at 5:30 pm, followed by the rest of the program. Register at Eventbrite. The next Open House Invitational is November 22.